Who Rides a WorkCycles City Bike? WorkCycles is an Amsterdam company founded by Brooklyn-born Henry Cutler. 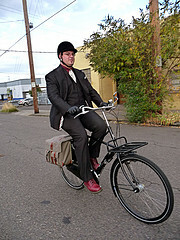 To date, Henry has exported nearly all of the Dutch bicycles we’ve introduced to Portland, including the conspicuous Bakfiets Cargobike, but also a “Classic” series of city bikes. These are the finest examples of their type, a rarity in North America but the very soul of everyday Dutch biking sensibility. Timelessly beautiful and frankly heavy, what these hard-working tools may lack in miles per hour, they make up in miles per year (MPY) by being so capable, versatile, comfortable, and low maintenance. Miles per lifetime? According to Eric Kamphof, “The average Amsterdammer leaves their bike outside year round, rarely tunes it, and rides it nearly 3000 miles a year. The average age of a bike in Amsterdam is nearly 35 years old.” Meanwhile, WorkCycles city bikes are built and equipped quite a bit better than the average Amsterdammer’s best bike: they are “forever” bikes. 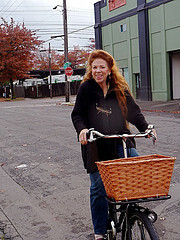 This is Zuzana on her Oma, our most popular bike in this range. 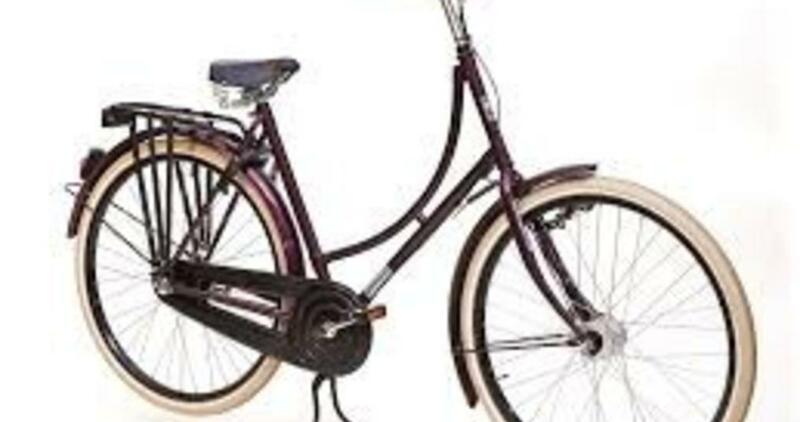 Its exceptionally tall head tube and stem permits mounting of a very large basket on the “Pickup” rack fixed to the frame up front, without the bars colliding with the basket. 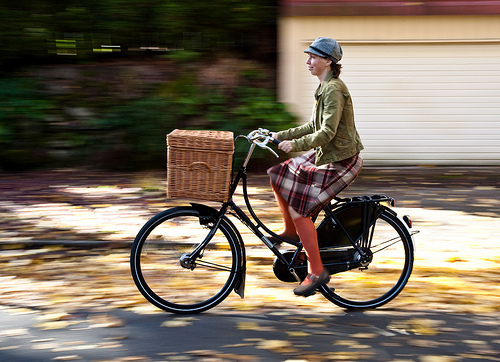 Zuz reports that she rides her Oma faster, further, and more often than the less substantial Electra Amsterdam “Classic” that first whet her appetite for Dutch-style riding. Zuz’s husband Bryan rides an Opa fit with the same front rack and a shorter box of his own construction. Bryan also races cyclocross. Some people suppose that utility bikes have no sporting appeal. We suppose they offer sporting bikers a more regular workout, weaving “training” into daily errands by replacing car trips instead of subtracting from leisure time. Same goes for non-sporting bikers! 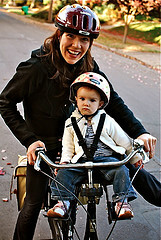 For their two children, Bryan and Zuz rock a Bakfiets. Cedric Justice is an energy efficiency and greenhouse gas management consultant. Cedric rides a 65cm Kruis. At 6’5″ and 300lbs, Cedric has a history of destroying bikes. We’d be lying if we denied he’d deformed even the steel cranks of this bike once! This early 20th-century frame design, exuding steampunk flair, is the strongest and stiffest in this line, ample not only to withstand him but also Victorian picnic lunches and environmental monitoring and analysis equipment on both front and rear racks. Cedric rides with an English equestrian helmet over his cerulean locks because, he explains, nothing else goes so well with an Ascot. He enjoys catching up with cars and faster bikes at every single stop on his commute. This is Lisa, who with her husband Nathan were among our first Oma & Opa couple customers. Each time they ride off together we remark how badly we wish we had a camera ready: it’s love and elegance on wheels. My Oma has changed my bike riding for the better. I ride much more often, and in all seasons. I feel safer, even though I no longer wear a helmet. Sitting upright I am more visible to cars. 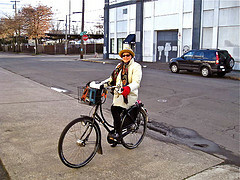 I can carry much more cargo on my Oma than my previous bike, without feeling like I am compromising stability. As I rode up Clinton St. one day a young woman sang out the theme for Miss Crump in The Wizard of Oz, as she speeds towards Dorothy’s house to take Toto. Without too much hesitation I assured her “I’ll get you my pretty, and your little dog too.” And we laaaaaaaughed! This is Sandra and her daughter Nadia Del Pasqua. Sandra is a doula, postpartum caregiver and personal trainer. So many bikers—new mothers especially—don’t survive the transition from a “commuter” model of biking to the “minivan” model imposed by parenthood. We’re grateful to Sandra for her example. Instead of buying a second car, we decided to buy me a bike. I honestly feel like a queen riding the Oma around. Seriously, there are times when I just want to wave to strangers….and I think they feel the same way. People seem to love to see Nadia riding up front. We use this bike all the time to do our grocery shopping, get to our doctor appointments and to the gym. I’m excited to see how she does in the winter! Beth is an actual Grandma (Oma) riding a bike of the same name. Beth is 65. She’s been riding her whole life, in recent decades the US norm of mountain bikes and hybrids mongrelized to pass tenuously as city bikes. She stopped by our shop to ask only about a basket, but with a little encouragement she gave an Oma a turn around the block. “Where have you been all my life? !” her face said upon her return. A few days later she hauled it off on the back of her vintage Volvo. We’ve seen Beth tooling around the neighborhoods and at the market since, with the same joyous gleam on her face of making up for lost time.